The basic formula for fantasy roleplaying is simple: kick down doors, kill monsters and take their stuff. 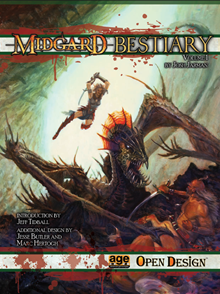 That’s how Jeff Tidball, AGE System Lead Developer at Green Ronin, calls it in the introduction to the new Midgard Bestiary: Volume 1 by Josh Jarman. 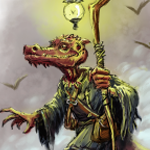 Between its covers lurk some of the greatest monsters that Open Design has unleashed on players over the last five years — ready to deploy in your AGE System adventures. Originally created for the Midgard campaign setting, all of them are easily adapted to your homebrew campaign or another published setting. You’ll find lots of old favorites here: foes and allies from the Free City of Zobeck, the empire of the ghouls, the courts of the shadow and river fey, the Old Margreve forest, and the Ironcrags. AGE system GMs now have a toychest that includes the steam golem, kobold slyblade, ghost knight, imperial ghast, bonepowder ghoul, roachling, free canton siegebreaker and the spark. 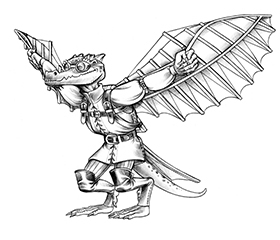 There are also brand new foes from the Midgard campaign setting, including the dust goblin scavenger, harem assassin, and Bemmean wizard. 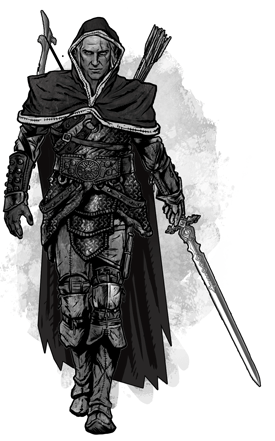 The approaching figure’s features are hidden within a deep cowl, but his fey blade and aura of crackling energy mark his elven heritage. Rarely seen outside their ancestral homeland in the foreboding Arbonesse forest, the elves of the old Valeran Empire still train in the martial and magical traditions that once made them rulers of most the known world. Arbonesse exiles travel the roads of Midgard either because they were forced out of the River Court for some slight, or because they’re on secret missions for their lords – typically to recover a lost artifact of the ancient empire that has fallen into mortal hands. Knowing well the mistrust and hatred for their people still held among many members of the empire’s former servitor races, traveling Arbonesse often guard their appearance with heavy cloaks and deep cowls. They are unmistakable in battle, however, wielding fey blades and arcane magic in equal measure to destroy their opponents. Favored Stunts: Lightning Attack (2SP), Seize the Initiative, and Skirmish. Fey Weapons: Arbonesse Exiles can channel spells through their blades. Spells: Arcane Lance, Frost Weapons, Heal, Lightning Bolt, Shock, Stone Fist, and Winter’s Grasp. Heavy Elven Chain, Long Bow, Long Sword, and Short Sword. You might have noticed this book is Midgard Bestiary Volume 1. What’s your favorite creature in this set, and what might you like to see in a future volume? It is the finest Bestiary that Open Design has ever done. Ok, ok, also the first, but I think it turned out incredibly well. I’m hoping to see some additional humanoids and maybe more shadow elves next time. Also, giants. Well, I am compiling a list of monsters for a possible volume 2, including some of the awesome beasties that appeared in Northlands and the Book of Drakes, so lets all keep our fingers crossed. Its awesome to see your name on that (also awesome) cover Josh! Great work. Speaking of covers, I forgot to say how wowed I am by that great Aaron Miller cover art. It really captures the feel of the fast and furious combat system in AGE. You can almost see the Dragon scoring a Knock Prone stunt on the centaur, while the elf rogue comes in for a flying backstab. Awesome!